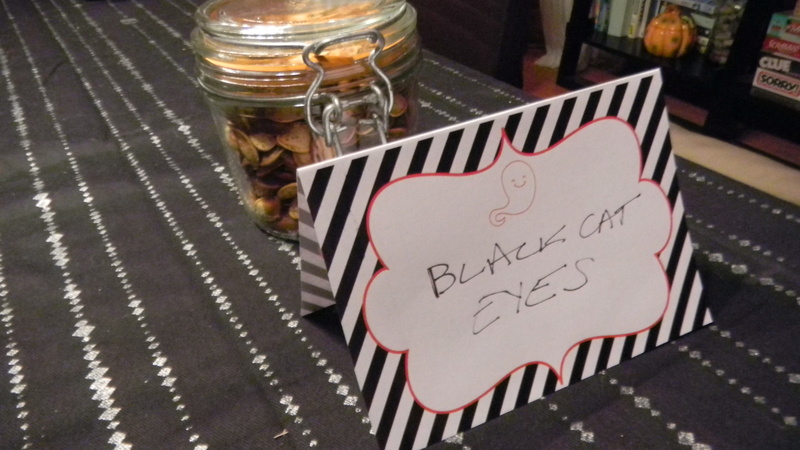 Last night, some friends came over and we celebrated Halloween in a small way. A kind of old school way. I made Dan hook up a DVD/VCR in our living room so I could bring out some old movies, on tape, that we hadn’t watched since high school. The movie we ended up watching: Scream. Wow is that movie old. We googled it, and it was made in 1996. No wonder Sydney was so suspicious that Billy was making those scary calls to her. he was the only one with a cell phone! 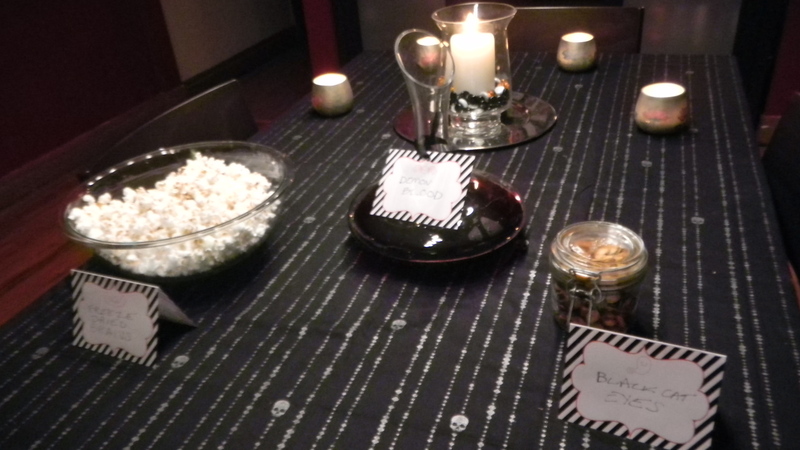 I made some snacks to go with the movie, and kept in the Halloween theme. 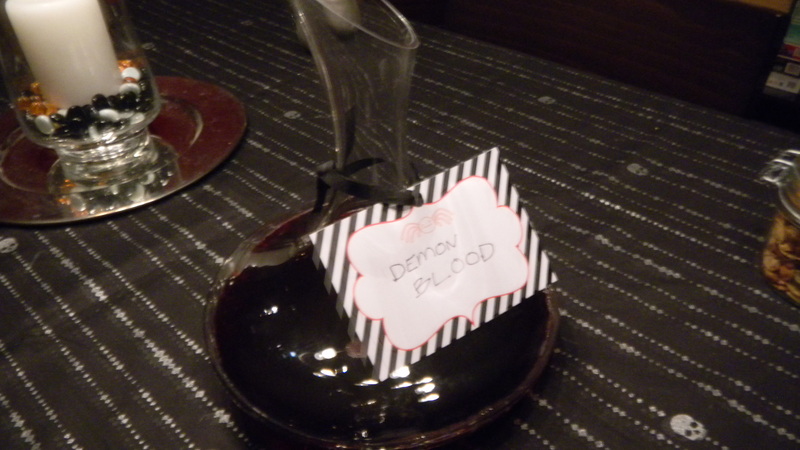 and demon blood (red wine in a fancy decanter). I found those cute little tags here. You can print them for free! I cut out the one for the decanter, but for the other two, I folded the paper over to have a standing place card. I’ll be continuing the festivities tonight by dressing up (OK, just putting on a witch hat) and handing otu candy to all the trick-or-treators. How will you celebrate Halloween today? Looks awesome and yummy! Wish I could have been there. I’ll have to try that spiced popcorn…I will be spending Halloween studying the mechanism, clinical use, and side effects of about 200 drugs tonight for my final. Some drugs can make you a bit zombie-like. Is that close enough to Halloweenish? We missed you! 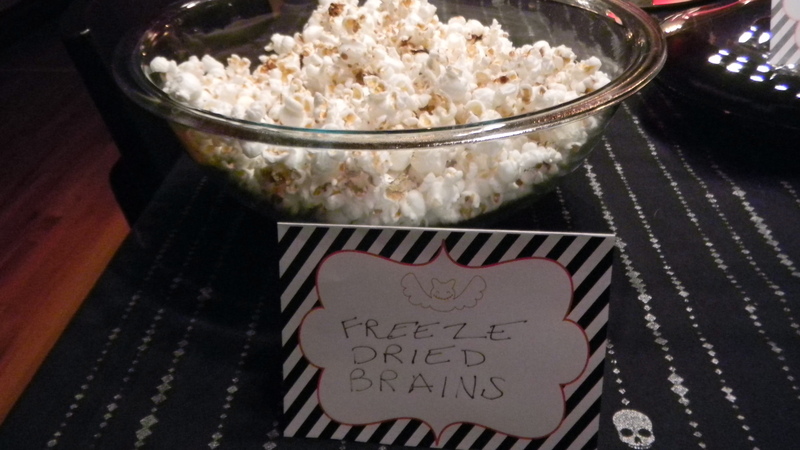 Definitely do try the popcorn – it was really tasty. You, of all people, would like it! Don’t forget to use that awesome special popcorn bowl you have when you make it!Good luck on your test. Not sure the spaced out side effect is quite Halloween enough, but hey, you do the best you can. Have a fun night!